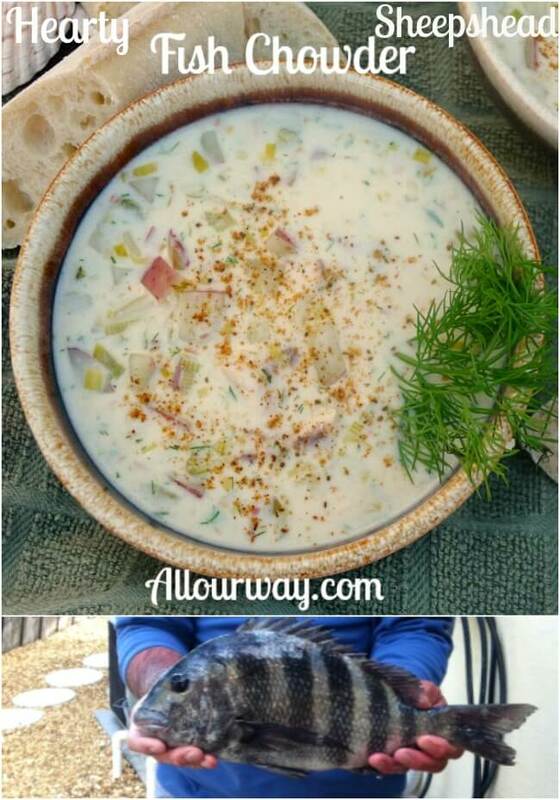 Sheepshead Fish Chowder was the first recipe we posted on All Our Way. We thought it would be great to bring forward. 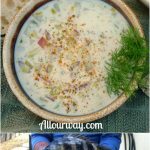 It is a fantastic seafood chowder and very easy to make. With Fall fast approaching this is a hearty satisfying soup. Try it — we guarantee you’ll love it as much as we do. 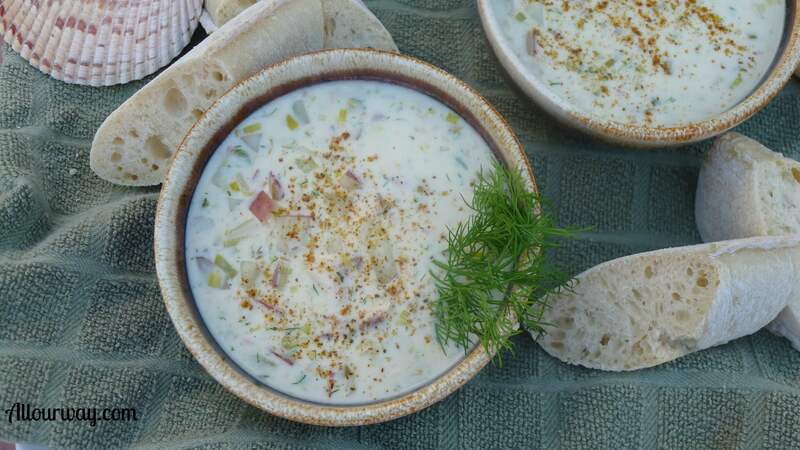 For this recipe, you will need fish fillets, chicken broth, clam juice, hot pepper flakes, red potatoes, leeks, celery, unsalted butter, flour whole milk, bay leaf, heavy cream, fresh dill, lemon juice, salt, pepper. We decided to make a recipe for fish chowder but later we’ll post the secret to frying the best, the crunchiest fish or chicken you ever ate. Yes, we’re bragging! But it’s THAT good! You will notice that in Italian cuisine they use lemon quite often. The reason is that Italians love the fresh taste and brightness the lemons give their food. We enjoy making soups. They are satisfying nourishing, and economical. You can take a piece of meat and add barley some liquid to it and you have an old-fashioned stick to the ribs Beef Barley soup. And if you don’t have time you can purchase a rotisserie chicken and make soups in no time like Roasted Chicken with Vegetable Soup and Chicken Spinach Tortellini Soup. Don’t let the list of ingredients of this seafood chowder scare you! The Sheepshead Fish Chowder goes quickly and it’s a matter of just tossing them in. After all, the entire recipe takes 30 minutes. You can’t go wrong with a spicy fish chowder! These are just a sampling of all the wonderful seafood recipes we have. Be sure to take a look! Un caro saluto e alla prossima. YOU MAY NEED . . . The following are affiliate links. We are a participant in the Amazon Services LLC Associates Program, an affiliate advertising program designed to provide a means for us to earn fees by linking to Amazon.com and affiliated sites. This is the exact size Dutch Oven we use all the time. Its home is on our stove top. If we aren’t making soup we’re using it for some other dish. We’d be lost without it. We added some other items we used. Cut fish into chunks and set aside. In a large Dutch oven, melt the butter over medium heat. Add the leeks and celery, and cook stirring, until veggies are tender, about 5 to 6 minutes. Add the flour and cook, stirring for about 2 minutes. You don't want the "raw" taste of flour. Slowly whisk in the milk, broth, clam juice, hot pepper flakes, salt, pepper, and bring to a simmer. Add the potatoes and bay leaf, simmer gently until the potatoes are tender, about 10 to 12 minutes. The last two minutes of simmering add the sheepshead. Finally add the cream, dill, and lemon juice, and cook until heated through, about 2 minutes. Season with the sea salt and the freshly ground black pepper. Delicious served with crusty Artisan bread. Yum Yum Yum! This is absolutely fantastic! Looks so vibrant and lovely! I can’t WAIT to try this! Thank you for this great recipe! My pleasure, Mahy! It is really a very tasty recipe. Thank you, Tammy! You can use any mild firm flesh fish in the recipe. It will be very good. 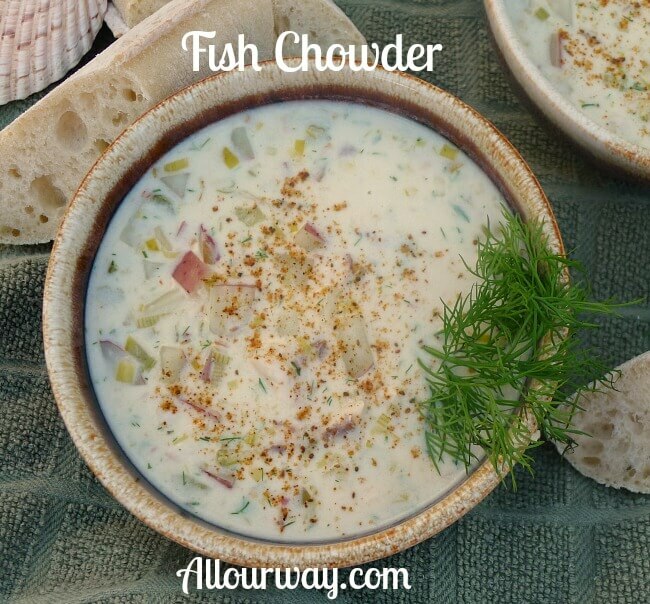 I love chowder but I must admit I have never had fish chowder. I’d had seafood – not really the same as fish, is it? You are so lucky to go fishing and catch such amazing fresh fish. You can make the fish chowder out of any mild firm-flesh fish, Veena. The chowder tastes like a light version of New England Clam Chowder. oh how lucky to catch such a beautiful flaky white fish. 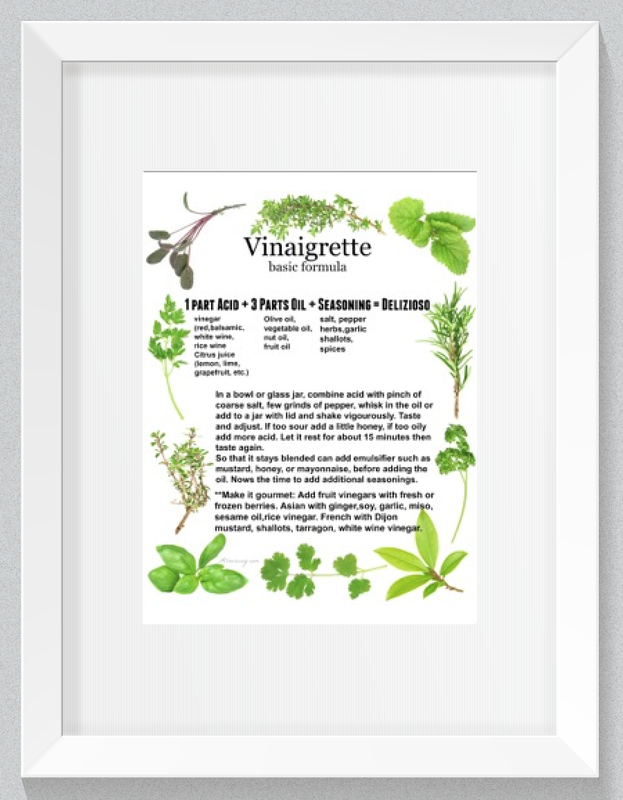 We love this one, not easy to come across but if we ever catch one again this will be the first thing I make with it! awesome job! I love seafood, but something I’ve never tried is a fish stew. This looks like it’s loaded with flavor, and perfect for the upcoming fall/winter season. I hope you give it a try, Joanna! It’s easy to make and so delicious! Hi, Wajeeha! We too love the fall dishes. There’s no wrong time of year for a bowl of good soup. Hubby’s a fish person and I’m sure he’d be up for trying this. Hi, Valerie! If he doesn’t get any fish — just pick some up at the store. Get a mild firm-fleshed fish for the chowder. 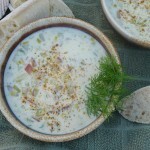 Looks like filling rich and creamy fish chowder good to start as fall soup recipe. . I haven’t tasted sheephead, I think I need to look for it. Hi, Swathi! 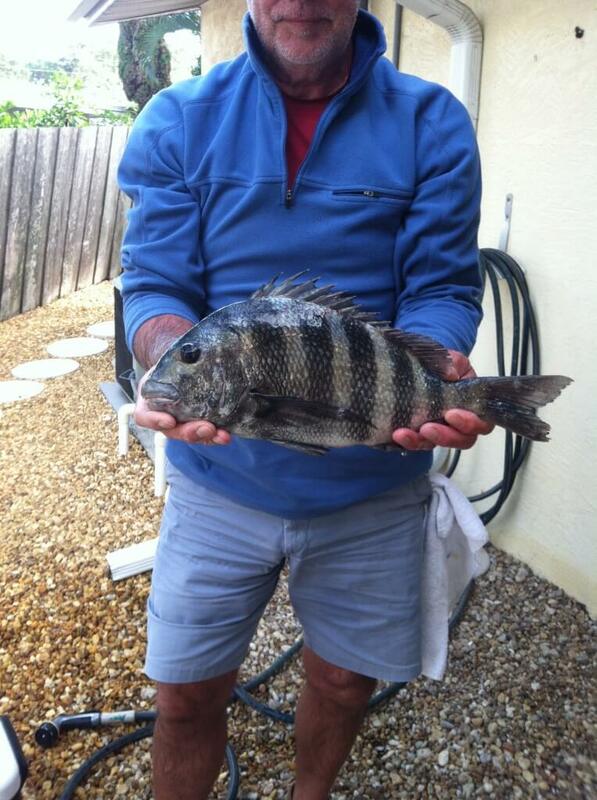 I don’t know if you’ll find sheepshead in a store but you can substitute. I never heard of or saw a sheepshead fish but that chowder sure looks good. Ciao, Linda! Sheepshead is popular on the Atlantic coast and Gulf. It’s a mild fish – for the recipe you can use any firm white flesh fish. We love New England clam chowder but that’s heavy on the cream — we prefer this way. It’s much lighter and still very tasty. See…now how I wish I lived closer to FRESH fish and seafood. I love clam chowder, and this version sounds delicious too. This is the perfect bowl of comfort food….and although I LOVE the summer…once the cold sets in…meals in bowls is where I turn.